While Singapore was busy with polling, I hopped on an overnight bus that took me to Ipoh. Why Ipoh? Well, it’s available as a last-minute trip, the return overnight bus tickets cost c. $60 and someone told me I should visit Cameron Highlands if I get the chance. Arrived at Ipoh at 8am, I headed straight to Aman Jayan bus terminal for the bus to Cameron Highlands. From the city internal bus terminal (Meddan Kidd), Bus 116 - approx 15mins. The bus to and back Cameron Highlands (counter D3) leaves at 8am, 11am, 3pm and 6pm, takes about 2 hours depending on weather, traffic and how many delivery stops the driver makes for his extra income. During the sinuous ascent to the hill station, we passed a series of sleepy small towns, greenhouses and numerous strawberry farms, but not as many as patches of construction sites. 2.5hrs later I arrived at Tanah Rata, which is a quaint town lined with local restaurants, cosy B&Bs and small shops. I was loving the cool breeze and mid-teens temperature up here 2000m above sea level. Except half the town was under heavy construction work… and the trail I started to trek was blocked by logs and fallen trees half an hour in. Hmmm..
Ah well. Second stop was BOH Sungai Palas Tea Estate. The bus dropped me off at The Junction, opposite Honey Bee Farm. 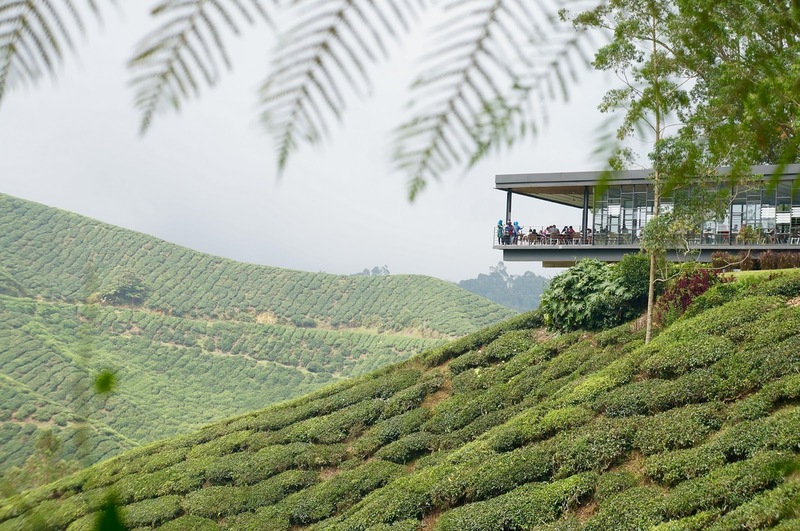 From there it was a 40-min walk with lush green views of neatly trimmed plantation. A thunderstorm and a missed bus and a few punts later, I made it back to Ipoh. 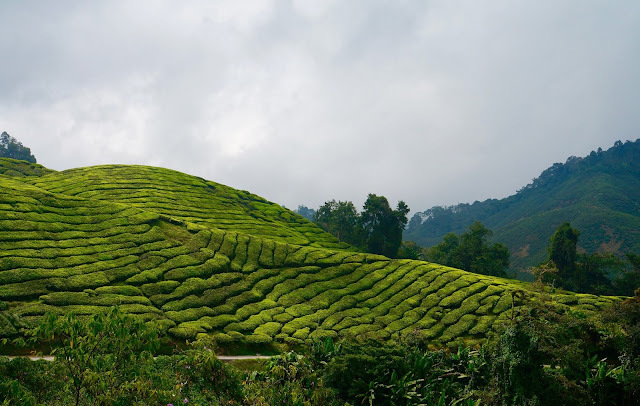 Was Cameron Highlands worthwhile? Perhaps; before the developers had their claws on it, when the picturesque landscape was left untouched. I’m still glad I went. I started the second day with some soya pudding (tau fu fa) at Funny Mountain. This store on Jalan Yau Tet Shin is renowned for their soya products. Locals would make batch orders of soya milk, then a few soya puddings that they devour back in their cars, before the shop keepers swoop away the empty bowls from the car window. And it was as good as what I’d get in Hong Kong. It might be a tad too sweet for me, but it didn’t drown the soya beans. Just to be clear, Singapore has no idea what they are doing with soya pudding. It’s a delicacy that should carry the aroma of soya beans, with a silky by firm texture. The ones in SG have been disappointing. Beansprout Chicken, or tauge ayam, is a local specialty of Ipoh. Lou Wong is the most famous beansprout chicken eatery, though their neighbour Ong Kee has been earning their fair share of fans too. I didn’t get a chance sample both for a fair comparison, but what I had in Lou Wong was pretty damn good. It was delicious; the crispy beansprouts and chicken was served in a rich, savoury gravy that was coated with a thin layer of fragrant oil. It wasn’t the smoothest chicken but the meat was still succulent. I had mine with sar hor fun, flat rice noodles, instead of rice. With a full stomach I made my way towards Old Town, passing random murals. It’s no Bansky, but entertaining nonetheless. The compact streets in Old Town was great for wandering. Concubine Lane was particularly charming. It was said that Chinese tin tycoons used to keep their mistresses here, where they smoked opium and gamble their days away. These have now been replaced by arts and crafts shops and cosy cafes. There are various mural arts by Ernest Zacharevic scattered among the pastel-shaded shophouses and stores, with the paints chipped and faded to help them blend with the Old Town's vintage curio vibe. I stopped for a coffee at the packed Sin Leong Kee. Strong, smooth and sweet. A short walk through Little India, I got back to Medan Kidd station and jumped on bus 35 to Perak Cave Temple. The temple was magnificent; the sheer size of the cave, the wall paintings, the calligraphy on the stone and the different buddhas around the temple. Above all, it was the tranquility that I appreciated most. No crowds. I followed the stairs to climb to the top of the mountain. It was not for the faint-hearted. Once you’re out of the cave, you’re about 1/3 of the way there. Follow the stairs next to the building, which links to rockier and steeper steps up the mountain. Just watch out for the odd snakes; I don’t think they’re poisonous though. I was the only one up there, and was rewarded with a view overlooking the city, accompanied by a soft breeze. I happily sat in the kiosk for an hour, undisturbed, before making my way down, with slightly shaky legs. To get back to the city, turn left from the temple and walk towards the tree, which is an unmarked bus stop. Back in Kong Heng Square in the middle of Old Town, there was a new hipster block with an semi-open crafty market, small boutiques and a glasshouse restaurant called Plan B. The lychee and watermelon ice was absolutely scrumptious. It was a great spot to pass time before the return journey. I liked Ipoh. The old city was calm, serene and effortlessly shabby-chic.